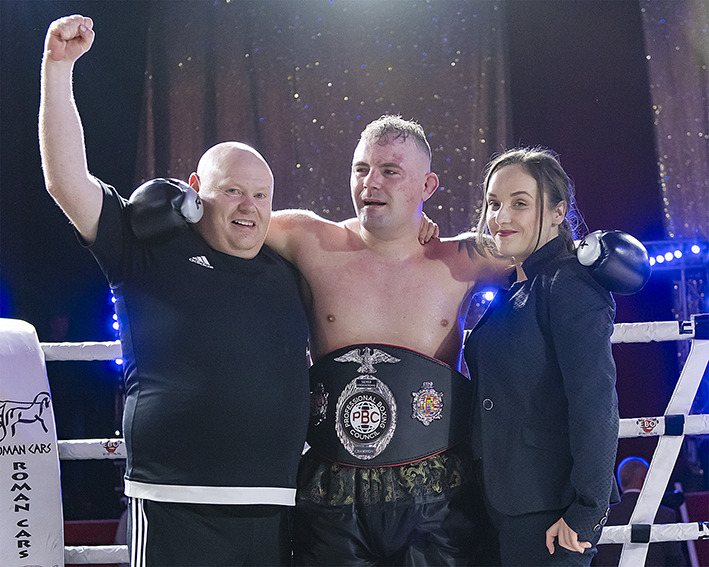 On Saturday night at the Princess Theatre in Clacton-on-Sea, Essex, Professional Boxing made a most welcome return to the seaside town after almost 80 years, when Colchester's Tommy Jacobs presented his latest boxing promotion, aptly titled 'History'. The previous pro boxing in the town, back in February 1939, see Ireland's Mike Kavan beat London's Charlie Mack at the then recently opened Butlin's holiday camp. Clacton is a town that’s steeped in boxing history, although since the second world war mainly of the Amateur variety, in fact Tommy Jacobs himself fought in the town on numerous occasions during his Amateur career and one of the greats of the sport is immortalized by the restaurant at the bowling alley on Clacton Pier, Armstrong’s, which is named after the American boxer John Henry Armstrong who beat British champion Ernie Roderick also in 1939. It seemed rather appropriate that the very first of the pro boxing contests of this new era should feature the current World Boxing Foundation (WBF) International and European Champion, as well as promoter of the event, Tommy Jacobs, in a non-Championship six round contest against Dundalk, Ireland's Michael Kelly. Right from the opening bell Jacobs took to the fight to his highly experienced opponent, albeit with just tentative testing jabs, but as the round progressed the action became more full on, with Jacobs backing up Kelly on to the ropes before letting rip with slick combinations to body and head. Kelly, a previous multi-title challenger in his own right, initially covered up and absorbed the shots but soon began to counter effectively. More of the same early in the second, although must credit Kelly for his slick responses that prevented Jacobs from having quite the same level of success in the first stanza, however as the clock entered the final 20 seconds or so of the round Jacobs started letting rip with big shots to the body with increasing success, so much so that literally in the final seconds Kelly was forced to take a knee after a particularly vicious left. Unfortunately Kelly struggled to catch his breath and rise to his feet in time to beat Referee Lee Murtagh's count, official time of the stoppage being 2 Minutes and 56 Seconds of the second round. Following the fight Tommy Jacobs announced that the reason he undertook a non-championship six rounder and not the originally planned WBF Intercontinental title fight against Albanian Xhuljo Vrenozi, was that he has been proposed to potentially challenge Australia's two time World Champion Sam Soliman for the World Boxing Foundation (WBF) World title in December. The second bout of the night see Dean Porter making his professional debut against Liverpool's Steven Sunners (2-0-0). What a cracking all action affair, from start to finish both lads really went for it hammer and tongs. 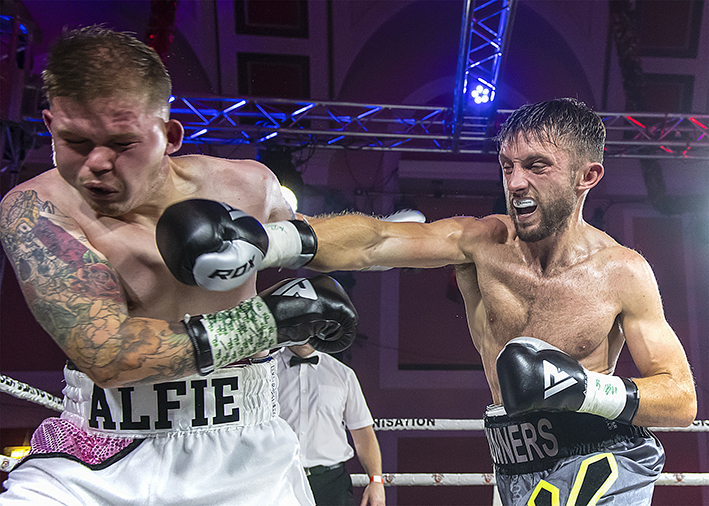 After four scintillating closely fought rounds it came as no surprise that the result was going to be close, and close it was, Referee Lee Murtagh's scorecard reading 39-38 in favour of Liverpool's Steven Sunners. Next up was a four round Featherweight contest between Clacton's very own Ben 'The Claxican' Cook and Belfast's Chris Wong, both of whom were making their pro debuts. The first couple of rounds, as with Porter-Sunners, were so closely fought that it wasn't easy to call the winner of each round, however in the 3rd the decision was made a little easier after Cook landed a cracking body-shot late in the round to send the Irishman to his knees. After four highly entertaining all action rounds Referee Lee Murtagh's scorecard read 40-37 in favour of local hero Ben Cook. As with the previous contest this was an all action thriller of epic proportions, so much so that it was without doubt it was the Fight of the Night. Have to say really enjoyed this fight and hopefully after this pair get a few fights under their belts there'll be a rematch as I would love to see these two in action against each other again, it was that good. The fourth fight of the night see Ipswich Super Middleweight Rob Elden making his pro debut against Liverpool's Lee Cooper. 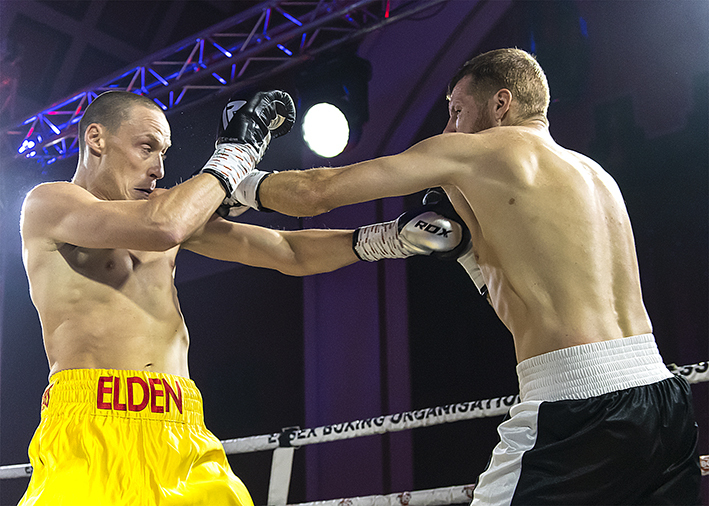 Elden started hard and fast, taking the fight to his more experienced foe and letting rip with big shots to body and head. Initially Cooper covered up but soon started countering with some big shots of his own, however in doing so left an opening in his defence that the Ipswich man was quick to capitalise on with a big right to the head to send Cooper to the canvas. Cooper made it to his feet and action resumed in very much the same vein, with Elden backing Copper up before letting rip with big shots, Cooper once again responded with big shots of his own. 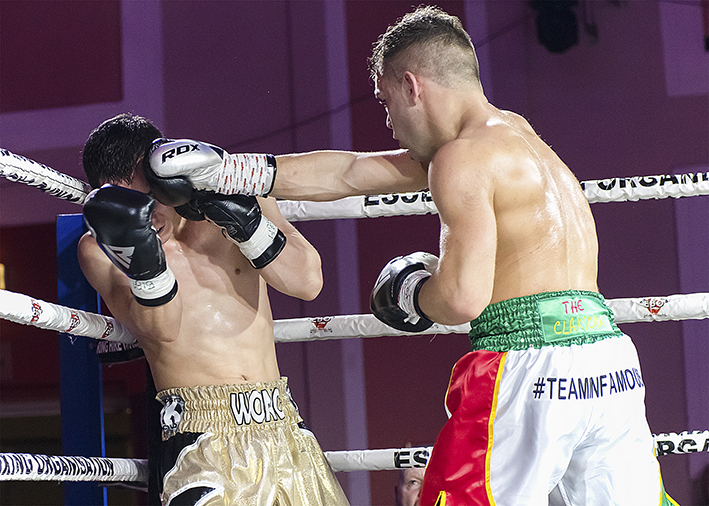 As the round approached the second minute, once again Elden found a chink in Cooper's armour and this time landed a big right to the body to send the Liverpudlian to the canvas for a second and final time. Official time of the stoppage was one minute and fifty-nine seconds of the first round. 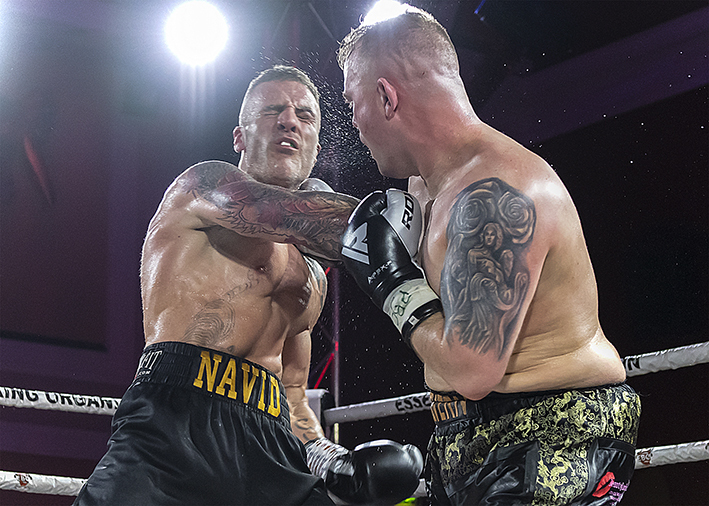 The headline fight of the night see Hove's Navid Iran and Scotland's Ben McGivern battling it out for the vacant Professional Boxing Council (PBC) Silver International Light Heavyweight title. Battling it out is the correct term; this was a Battle Royale of epic proportions. Right from the off Iran took the fight to McGivern, backing the Scot onto the ropes and letting rip with a flurry of big left and rights. McGivern sensibly covered up and waited an opportunity to counter, which he did with good effect once the opportunity arose. However it wasn't enough to prevent Iran coming back with a similar forceful attack almost immediately. McGivern once again managed to counter and initially take control. As the round progressed Iran landed a couple of cracking shots that again forced McGivern to cover up. Irann kept up the pressure with big shots, whilst McGivern caught most with his gloves a big right got through the Scots guard, shaking him to the core. How McGivern made it to the end of the round, I just don't know, his legs were well and truly gone, but somehow he did. Round two see Iran come out hard and fast, however McGivern was ready for the assault, again initially covering up but this time instead of just countering and covering, he spun his opponent and went hard on the attack himself. Round three see McGivern taking the fight to Iran, which led to some great technical boxing ensuing from both protagonists. The next few rounds were fought in similar vein. The final round though was an out and out war; both boxers throwing caution to the wind and an all out slugfest ensued for the entire final three minutes - what an exhilarating round. After eight fantastic rounds of boxing it was Ben McGivern declared victor by scoring referee Lee Murtagh, by a 79-74 points margin. Have to say whilst definitely the right result, the result just doesn't convey just how close each and every round, but the first, was. These two really put on a magnificent show and was a serious contender for the Fight of the Night award. 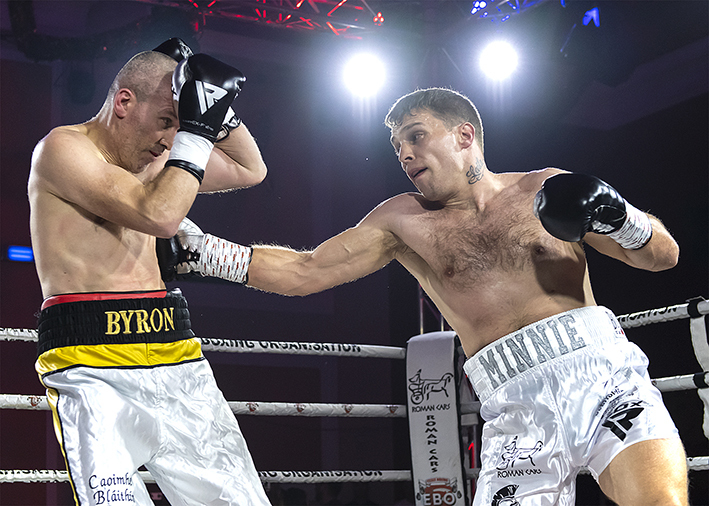 What a great event to welcome pro boxing back to Clacton-on-Sea after a close to eighty-year hiatus, a return clearly appreciated by fans of the pugilistic arts who had packed the historic venue to the hilt almost an hour before the event was scheduled to begin.